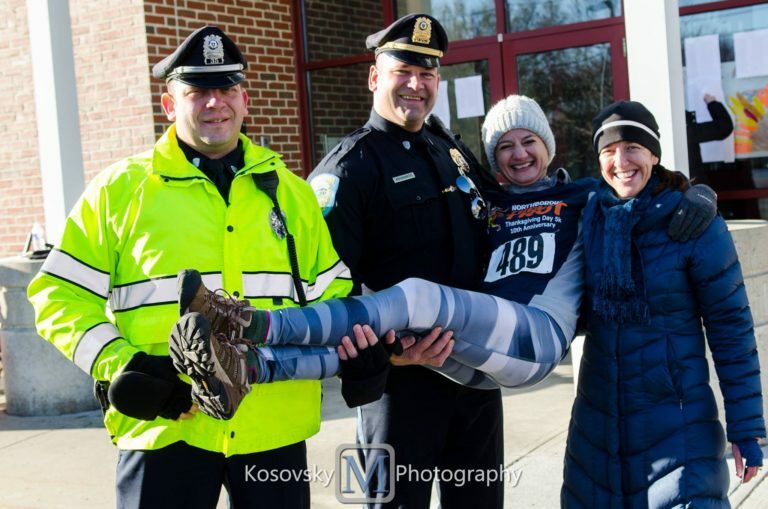 NORTHBOROUGH, Mass., Nov. 31, 2018 – Rita Matraia founded her business, The Core Connection, 290 W. Main St., in 2007, and even as she was establishing her new business, she found time to start the Northborough Turkey Trot soon after. Both have been successful. The Northborough Turkey Trot raised $18,000 for the Northborough Food Pantry last year, while attracting 800 runners. Meanwhile, The Core Connection, a boutique fitness studio, has expanded, recently adding the Core Cycle spin studio and now offering more than 100 fitness classes a week. But now Matraia is moving on from her fundraising road race to spend more time on her business, although The Core Connection continues to be a sponsor of the race. The Northborough Turkey Trot will continue under the leadership of Pamela Guggina, a Northborough resident and long-time participant in the race. Matraia initially saw the 5K road race as “a way to bring the community together,” when she and her friend Maggie Kosovsky invited 20 people to gather on her front lawn on Thanksgiving Day in 2007. Back then, she asked racers to bring along cans of food, which were donated to the Northborough Food Pantry. Over the years, she moved the start of the race to the Marion E. Zeh School, started receiving cash donations instead of cans, began producing t-shirts for runners and added corporate sponsors. The current route includes a 3K walk, along with a 5K run. The 11th annual Northborough Turkey Trot is scheduled to begin at 8 a.m. at the Zeh School, 33 Howard St., on Thursday, Nov. 22, 2018. Walkers and runners can register at NorthboroTurkeyTrot.com. Registration until the day of the race is $25 for adults and $15 and anyone 20 or younger. For those who register on the day of the race, the cost is $35 for adults, $20 for anyone 20 and younger. Children five and younger can participate at no cost, but will not receive a t-shirt. Adult-sized men’s and women’s t-shirts are available for participants, but supplies are limited. In addition to The Core Connection, Communication Technology Services, LLC is a gold sponsor this year. Silver sponsors are Flaherty Physical Therapy, Orthomed Massage Clinic, Realtor Karen Scopetski and Triple Crown Tack Shop. In addition to her fundraising efforts on behalf of the Northborough Food Pantry, Matraia has raised funds for other causes through The Core Connection. The fitness center just raised $1,500 for The Cancer Shmancer foundation, started by cancer survivor and actress Fran Drescher, which focuses on the prevention and early detection of cancer. October was Superhero Month and members of The Core Connection were encouraged to wear costumes and purchase raffle tickets for prize baskets. Events included a barefoot cardio kickoff, a glow-light cycle ride and a month-long Myzone challenge, which earned donations for participants who average more Myzone Effort Points (MEPs) than the staff as a team. The Core Connection is a boutique fitness studio in Northborough, Mass., that offers more than 100 classes per week, including Pilates, yoga, barre, spinning, Zumba, boot camps, restorative exercise, including postpartum corrective exercise and more. In addition to promoting movement and fitness through exercise, instructors at The Core Connection teach proper form, which helps promote good health. Additional information is available at www.thecoreconnection.com.